Were you aware that companies that blogged 16+ posts per month got 4.5 more leads that those that didn’t post anything? And, if so, have you ever wondered what would be the best type of blog format to pursue for your business? Here’s a lowdown of seven of the most popular blog post formats to try, to help you welcome more website visitors and spike those social shares.Once you've started blogging for your business, you may find yourself wanting to experiment with different formats. Either just to shake things up, or because you've found that what you're currently doing isn't working as you'd hoped. Good news! There are tons of blog formats to choose from. I’ve made it a bit easier for you to decide which to choose by drafting this list (that’s one format right there), because even your chosen content formats should be forming a part of your integrated marketing strategy. Bear in mind that some blog posts may comprise of two, sometimes even three, different formats. The point is that you should be considering the best format for the angle of the blog that you're writing. Considering your angle is important, but so too is who the content is for - so dive into your analytics and see which blog type your audience is currently engaging most with. They are fantastic for educational content which is the premise of inbound marketing content. They drive organic traffic from search engines as people search for tutorial type content. A hook line to grab the reader's attention and make them quickly understand why they need to read your blog. Introduction: An expanded introduction to your topic and some brief insight into what you plan to guide the reader through. The How-To Meat: A detailed list of steps to take in order to complete whatever it is that you're guiding them through (3, 5, or 7 step guides are most commonly viewed by readers). Conclusion: Conclude the how-to blog by summarising the steps in a short paragraph and tie up any loose ends. Bonus Tip: A how-to post that includes an instructional video or slide deck can really boost engagement rates. How to build trust and credibility with the right content marketing mix? The ‘what’ post is the perfect format to introduce or explain a specific concept, highlighting what it is (shocker) and why it's relevant to your reader. It essentially serves to answer the ‘what is …' question posed by people who are looking for a thorough explanation of the importance or relevance of the subject. 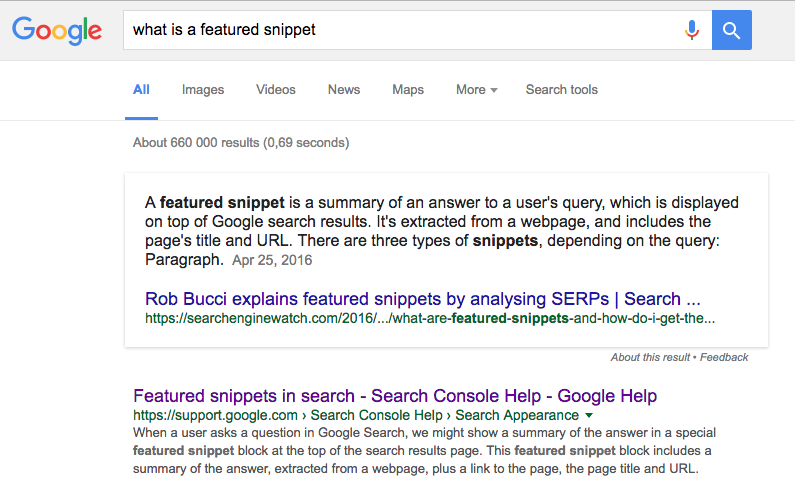 Bonus Tip: You can capitalise on these posts by trying to get Google's attention for featured snippets. This means that, if your keywords are working as they're meant to and your content is well structured, your content could be pulled by Google for a featured snippet in direct answer to a search query. It would look something like this below. Whether it’s a current trend, new tool or a general concept, the ‘why’ post can be helpful to draw attention and significance of the topic at hand. Much like the ‘what’ post, the ‘why’ post is inherently quite introductory in nature but goes a step further to back up the importance of the subject by answering the ‘why’ element of the argument. Why is this important to me? Why should I care? You should follow the same 3 simplified writing rules that I set out in the 'What' post to create an outstanding 'Why' post. Bonus Tip: The why post is also a great contender for Google's featured snippets, in answer to all those "Why?" search queries. Also known as the ‘listicle’, a mash-up of list and article, the list post is another hugely popular blog format. Perhaps even the most popular format of today. Why? Well, in a nutshell the formula just works! The list post typically includes a number of reasons, secrets, types or ways of doing something, giving the reader a very specific promise of what is on offer. The heading is a dead giveaway that you’re about to read a list post, by the fact that they include a number (either to list steps or items). The list post has gleaned a bit of a bad rep and often seen as a B-grade form of media. This is primarily due to the fact that it has become a format adopted by many low-quality blogs. But, with the right author, this format works very well to list tips, tactics, or ideas under a certain topic and can result in high-quality content (and high-quantity traffic). This very post is a classic example of the list post. A curated post is essentially a compilation of helpful resources about a certain subject or topic. Sounds easy? It can be, but research can also be time-consuming. The benefit of this blog format is that readers appreciate the fact that they can refer to a single post as opposed to scouring the internet and wasting their time. Curated posts are perfectly suited to posts that aggregate content, such as statistics or industry examples, and also help to build trust with your readers by aligning yourself with popular industry thought-leaders on various topics. This type of post is fabulous for establishing yourself as a go-to resource and building relationships with other bloggers and businesses that you reference in your post (no-one ever says no to a great link now do they?). Bonus Tip: If another blogger reaches out to thank you for linking to their blog, don't waste the opportunity to ask for some requited love. Make sure to request a do-follow link back to your blog from them. This is a light-hearted post that is purely for entertainment purposes can be refreshing for your audience. So long as you are careful to use this type of post moderately. There's no particular structure to this post, instead the format is focused around the type of content that you're sharing. You might be wondering what the purpose of this blog post might be. But, it's simply that everyone enjoys a good chuckle every now and then. Just because you’re writing about some great ideas and content, it doesn’t mean you don’t have a personality or a sense of humour. Holidays or the end of the week are good for these types of posts, when your audience is looking for a slight break from the normal run-of-the-mill posts. But! Always remember to keep your buyer persona in mind, ensuring that the content you’re sharing will actually resonate, intrigue or entertain them. Infographics have become incredibly popular, most especially among B2B marketers, as they can present a lot of information – especially data or statistics - in a visually appealing manner. The infographic post is one that requires hefty resources upfront but can result in big rewards in terms of social love with potential for shares and inbound links. How to create stunning infographics for your post? Remember that it's not enough to simply change up the format of your blogs and expect a sudden change in traffic or conversion. You need to choose your blog format according to your audience, which will help you to wrap your content around great keyword research to reach the right readers. Make sure to have a look at your analytics before choosing your next blog post, and see which of these seven your audience is viewing the most. Also, no matter what style you decide to pursue, make sure your blog is easy to read and has a drawing call to action. It should also be peppered with relevant images, bold texting and meta descriptions, to pull the reader towards the content. A “click to tweet” button or other social media sharing options will further make your free blog easily disseminatable across the internet. *This blog has been repurposed from a previous blog.